Photo Credit: Barry Albert for Speedwaymedia.com. FORT WORTH, Texas — Hard feelings were had following the AAA Texas 500 when eighth-place finisher Aric Almirola had harsh words for third-place finisher Joey Logano after contact between the two pushed Almirola out of the top-five. 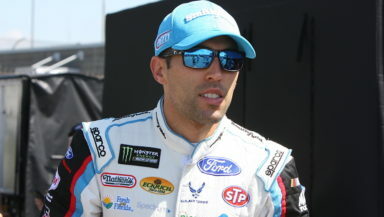 When asked how far he’d be willing to take things with the 22, Almirola was clear he’d make it difficult on the Penske driver when Homestead arrives on the schedule. While Logano is currently locked into the Championship round in Miami, Almirola goes into ISM Raceway in a must-win situation as he sits seventh on the Playoff grid. He holds an average finish of 16.3 at ISM Raceway despite finishing seventh there in the Spring. The final race in the Round of Eight will be the Can-Am 500 at ISM Raceway on November 11. The four contenders for the championship round at Homestead on November 18 will be decided following this race. I’m not a Logano fan at all but in this instance he did nothing wrong. Aric needs to shut his mouth and drive his car. You can’t be one way when in a situation and be totally opposite the next time. You have a great opportunity to drive a top notch ride in Nascar. Do that and don’t cry when your in a bad situation, stuff happens just like in real life.There are thousands of drivers out there that are better than you and will never get a chance to do it. So again I say shutup !